Pat Buchanan Defends Hagel, Slams "Apartheid" In Israel On "Hannity"
PAT BUCHANAN: I think Chuck Hagel is a good man, he's a patriot. He's got an independent mind. I disagree with him on the surge. I supported it, but I tell you, I myself said that the Iraq war -- the invasion and the occupation of that country and killing thousands and thousands of people, to deprive it of weapons it did not even have, weapons of mass destruction that were not there. I thought that was one of the greatest blunders in American military history. BUCHANAN: Let me respond to that. BUCHANAN: Alright, look. We had an embassy in Nazi Germany for eight years, recognizing the government as legitimate. Was it wicked and evil? Yes. FDR recognized Stalin in his government in the middle of the wholesale massacre of Ukrainian people. HANNITY: You really think that this is a legitimate and elected government in Iran? BUCHANAN: Unfortunately it's legitimate. I think they stole the last election, but is it in the United Nations? Yes, it is. And should we talk to them? Yes, we should. HANNITY: Talking to them and whether or not their legitimate and elected is a different story. BUCHANAN: Sean, Ronald Reagan wanted to eliminate nuclear weapons, would you disqualify him to be Secretary of Defense? HANNITY: Ronald Reagan believed in peace through strength, and Ronald Reagan had a very different mentality than Chuck Hagel. BUCHANAN: He wanted to get rid of nuclear weapons. HANNITY: Well, he did, but he also believed in strength. The difference between him and Chuck Hagel is that Chuck Hagel wants to pear down the military so it doesn't have the gap of vulnerability that Ronald Reagan fixed after Jimmy Carter became president. BUCHANAN: He has a voting record that would look just like yours if you were in the U.S. Senate. 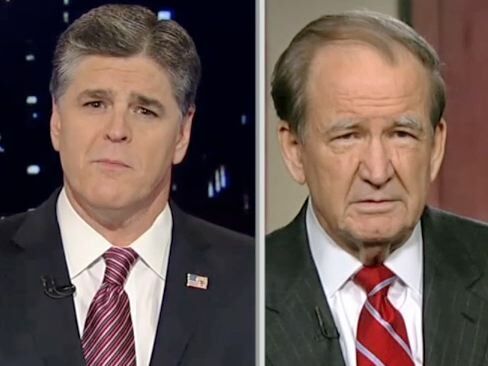 HANNITY: It would not like mine, Patrick J. Buchanan. He says the Palestinians are caged like animals. His comments -- he got burned bad by Lindsey Graham today, he looked foolish. And the same with Ted Cruz and the same with John McCain. He did not seem like he was equipped to answer a single question today, Pat. BUCHANAN: Obviously, he's being political right now. But would you not agree, even the Israelis would agree that the condition of the Palestinian people now is not ideal. That's why they want a two state solution. There is real disagreement with how they are treated in Gaza. Why can't an American not say the same thing? HANNITY: Patrick J. Buchanan, I don't think the Israelis have put them like caged animals or "they've been chained down for many years." Israel has been the victims of thousands of rockets fired into their city. The Israelis are helping them.